Interactive Sight Reading at its Best! 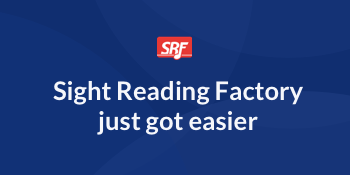 SightReadingFactory.com makes practicing the important skill of sight reading easy, effective and fun! This cloud-based service allows you to customize and generate unlimited sight reading examples instantly, on-demand for music educators, students and hobbyists of all ages and abilities. Sight Reading Factory can be used on virtually any device through the web browser or with our free native app for iOS devices. Join the thousands of musicians all over the world who use Sight Reading Factory every day. Learn how Sight Reading Factory makes sight reading easy for educators, students, and independent musicians alike! The sight reading and sight singing exercises produced are governed by many rules so that they make 'musical sense' in that they are rhythmically, harmonically and tonally appealing. In other words, although the music is computer-generated, it still sounds like real music. Save time from having to compose or search for sight reading and sight singing exercises for yourself or for your students to practice. Quickly and easily generate quality sight reading in a fraction of the time you would normally spend. The sight reading exercises can be fully customized to your specific needs or the needs of your students. You can select one of the standard difficulty levels or you can customize the exercises by selecting the exact rhythms, range and other attributes such as leaps, accidentals, dynamics and articulations. You can also choose from a large variety of time signatures and all major and minor key signatures. See Feature Focus: Customization for more information and videos on how to customize the sight reading. There are multiple levels of difficulty that progress with more complex rhythms, larger leaps, expanded ranges, and increased accidentals. The lower levels are appropriate for beginning level students while the upper levels would be a challenge for the most seasoned musician. Subscribers to the Sight Reading Factory® will never again run out of sight reading material to practice. Every time the user clicks 'Generate Sight Reading', a brand new piece of music is composed. This allows the user to generate virtually infinite amounts of unique sight reading exercises for piano, guitar, voice, strings, woodwinds, brass, and percussion. Full ensemble sight reading exercises can be projected to the front of the classroom for choir, concert band or orchestra to practice sight reading together. Educators can also use the assignments and recording feature as a tool for assessing their students. See Feature Focus: Assignments for Educators for more information and videos on the assignments and recording assessment feature. Try the new Sight Reading Factory beta! The new and improved mixer and music pages feature a better mobile experience, new features, music that scales and much more! You can now select your own custom set of key and time signatures! Sight Reading Available for Over 30 Unique Instruments! "Sight Reading Factory is a great resource for my classroom! SRF keeps my choir students centrally focused and makes a huge savings on paper." "Sight reading is a foundational technique for my choral program. As a result, I have continually looked for websites to be a support tool to our classroom activities. Sight Reading Factory has been a fantastic find! My students love using it. The variety of examples and levels, along with the ability to hear the correct sight reading is priceless. Thank you for offering a quality product that is extremely accessible and affordable." "We love your program -- I have seen tremendous improvement in my students' sight singing skills and confidence!" "Sight Reading Factory is the best place I have found to generate practice pages customized to my level of achievement. I am studying classical guitar and when I find a piece or etude that challenges me, I can come close to reproducing the problem area including, the key, time-signature and note values and then print sheets for reading practice." "In seven months I've gone from needing to decipher and memorize tunes, to sight reading basic jazz in live situations. This app saves you the time and energy of finding material to read at your level. Yup, I recommend."